A Wrinkle in Time is the latest adaptation of the beloved children's book of the same name. A Wrinkle in Time is the story of Meg and her little brother Charles Wallace on a quest to locate their missing father. They are guided on their travels out of our known galaxy by 3 celestial beings (Mrs Which, Mrs Whosit and Mrs Who played by Winfrey, Witherspoon and Kaling respectively). The epic quest quickly goes from lighthearted to dangerous as they're forced to confront the growing evil entity known as The It. Let's get right to it. Is it any good? Well yes, it is. Is it as good as the book? Of course it's not. We'll get the bad out of the way. All of the goodwill that was built in the 1st and 2nd acts of the movie is lost as the 3rd act slowly careens off the rails. I found the last 30 minutes or so of the movie to move at a snail's pace. The set up for the final showdown between good and evil was laborious. Were the problems so egregious that I ended up hating the final product? No. But it does feel like a sort of almost miss when you step back and examine the final product as a whole. Let's get back to the good, shall we? The visuals are stunning. Mrs Whosit (Witherspoon) was really the stand out for me. Her perfect amount of whimsy was spot on. I was pleasantly surprised by how engaged I was with the young actress who played Meg (Reid). The success of this movie was always going to rise or fall upon her shoulders. It's a heavy weight for one so young (Reid is only 14 years old). The themes of this movie are timeless and were handled with deft hands. I felt more than once as though Momma Oprah was speaking wisdom directly to the bruised 12 year old child that still lives inside of me. Loving yourself, not in spite of your flaws, but because of them is a wonderful lesson for children and adults alike. Yet DeVernay never allowed this to creep into the saccharin territory of the too sweet. 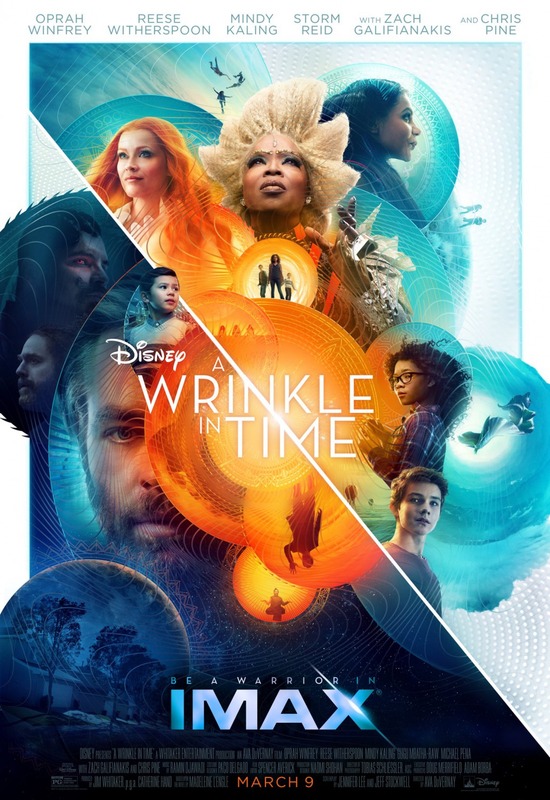 A Wrinkle in Time clocks in at 2 hours and is rated PG for thematic elements and peril. I give it a very solid 3 ½ stars out of 5.